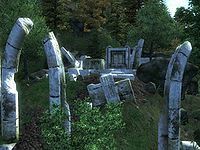 Anga is a small Ayleid ruin between the Imperial City and Bruma containing NPCs (quest-related). It contains only one zone, Anga. This ruin is inaccessible until you have begun the associated quest. Anga also appeared in ESO. On subsequent visits, you will be unable to get to the two boss-level chests as the push block which opens door D has not been reset properly. You can get around this bug by loading the autosave after entering the ruin or by saving within the ruin and reloading the save. The door will then be open. The ruin has several inscriptions in the Daedric Alphabet dedicated to Namira. "She watches over us shadowing us with her dark embrace. The forlorn exist eternally in the darkest pits." 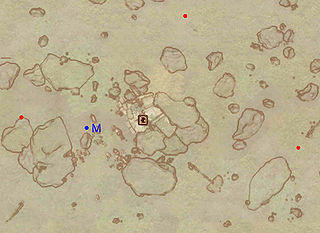 This location's map marker (M on map) is named Anga (editor name AngaMapMarker). The entrance door is E of the marker, 70 feet away. The four Priests of Arkay, who are your targets for Namira's quest, are spread throughout the dungeon (all at Q). Each one conveniently has a cluster of three Forgotten Ones nearby, who are ready to attack the priests given the opportunity (i.e., darkness courtesy of Namira's Shroud). Be sure to not kill the priests or any of the Forgotten Ones yourself if you want to successfully finish Namira's quest. The boss-level ayleid reliquaries (B) and the only undead in the dungeon are in a hidden room. 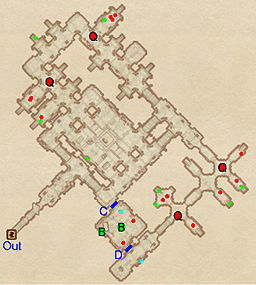 It can be accessed by opening the hidden door at D using the push block (cyan dot on map). Opening the second hidden door at C by stepping on the pressure plate provides a quick shortcut back to the entrance. The undead are the only occupants of this dungeon who will attack you (without being provoked). There is one door in/out of this zone, leading outside. 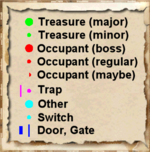 2 Hidden Doors are at C and D. The first door, at D, is opened by a push block on the opposite wall. The second door, at C, is opened by standing on the activation plate in front of the door. The cyan dots on the map show the locations of the activators.